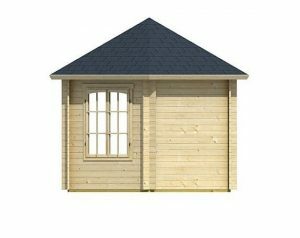 Log cabins can be a beautiful addition to any garden, but few are as eye catching as this well proportioned garden building from Waltons. 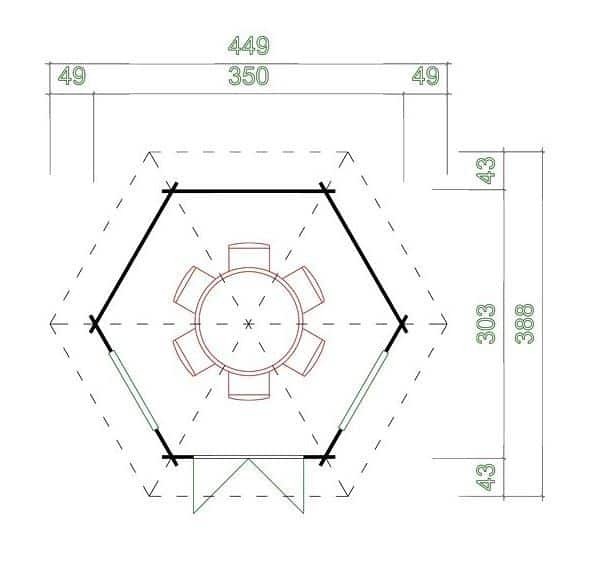 Its hexagonal design certainly makes it stand out from the crowd, for all the right reasons, but it provides lots of practical benefits as well as looking good, being suitable as a garden storage facility, workshop, or a summer house for you to relax in as you look out at your garden. It’s a very pleasant environment to spend time in, largely because of the amount of natural light that comes in. The large double doors are themselves glazed, and the remaining five panels all feature full sized sash windows. The advantages of sashes is that they can be opened and shut freely, which is an easy way to regulate the temperature and allow ventilation into the building. It’s also dry inside the building, thanks to the excellent waterproof qualities it possesses. 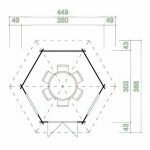 The first aid to this is the apex roof that sits on top of the log cabin, which also gives it a tall profile and lots of headroom. We were pleased to see that tongue and groove cladding had been used across all the surfaces, creating a stable and resilient structure. If the treatment requirements are adhered to, it should even outlast the long 15 year anti-rot guarantee provided with it. 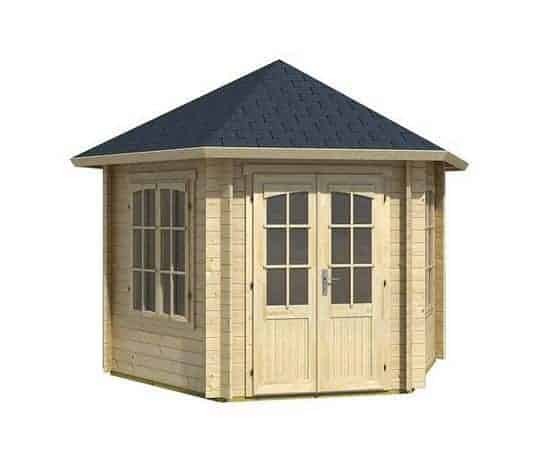 Whilst ostensibly a hexagonal apex roofed log cabin, this has the look and finesse of a summer house, so it brings a touch of real luxury to your home and garden. 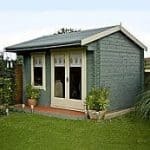 We were pleased to find, however, that this is a garden building that performs as well as it looks, with attention to detail and high quality components being noticeable throughout. 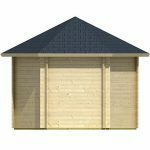 The apex roof itself is made of tongue and groove cladding, which is what we always like to see as it provides a tough and reliable base, topped by mineral felt. It’s also one of the tallest we’ve seen and gives a ridge height of 9’11 and an eaves height of 7’3. The overall width of the shed is 11’5 and the overall depth is 9’11. With a large and complex design like this it’s important that the cladding and frame are thick and strong enough to give a good core stability. That’s why we were pleased to see that 34mm logs had been used on the walls, which is thicker than most that we see. Neatly locking together in a tongue and groove pattern they are also very effective at preventing gaps that could otherwise allow water in. Tongue and groove cladding is also used on the floor, but with a thickness of 19mm which is the same as that used for the roof. 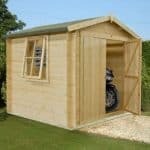 Once again this is thicker than most flooring that we see on timber sheds and cabins, so it feels reassuring strong when walked upon and should be resilient enough to take furniture and heavy items. 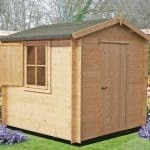 It was good to see that the manufacturer has provided a 15 year anti-rot guarantee on this log cabin, which is as long as any that we see on the timber garden buildings we review. What was less impressive, however, was that Waltons have not used any preservative treatment on the timbers prior to shipping. 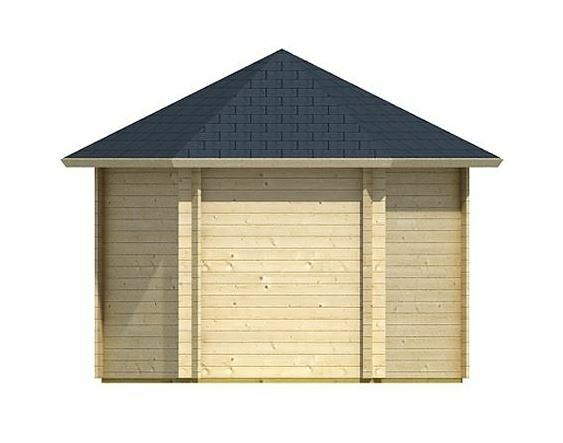 At this price we would have expected to see a pressure treatment applied to give a long lasting protection, but the lack of this means that the customer not only has to treat the shed themselves on an annual basis they also have to apply a good quality wood preserver immediately after the log cabin is assembled. Failure to do this can invalidate the guarantee. We were very impressed by the double doors, and not only by their classically attractive appearance. Strongly hinged they open to a width of 4’1 and a height of 6’5, so even the tallest of owners will have no problem walking in and out. It also becomes easy to transport items of furniture into the cabin to make it a home from home. The doors themselves are half glazed and take up one of the six panels, the other five all feature their own glazing in the form of sash windows. This means that even on the warmest days, the windows can be opened to create a pleasantly cool interior. It also means that the building is bathed in light, making it a good place to carry out a hobby or to sit and read a book. With a thickness of 4mm, however, we would have preferred to see tougher glazing used. The profusion of windows can create privacy and security concerns, as it allows passers by to easily see what’s kept inside. One security feature that we do welcome, however, is the sturdy lock which comes as standard. Operated by a key, it creates an opening that can be just as secure as your house door, although we would also recommend the fitting of an alarm system if you plan to keep anything of value inside. 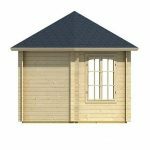 As a nation we’re becoming much more environmentally aware, which is why we were pleased to see that there are five different solar panel options available for this log cabin. 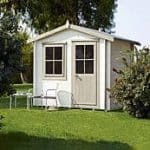 It’s a greener way to generate electricity for the building, and means that you’ll be able to install all the electrical equipment that can make a summer house so enjoyable to spend time in. Another customisation option is the ability to add a shingled roof, although we find the standard roof both attractive and effective at keeping rainwater out. We would expect a log cabin made by Waltons to be manufactured to a high quality, and thankfully that’s just what we found. The tightly fitting cladding is very effective at stopping water ingress, as is the apex roof whether or not the optional shingle pack is added, but the use of pressure treatment would have enhanced the durability. The six sided design doesn’t adversely impact upon the interior space, and thanks to the tall eaves there’s lots of vertical space available as well. 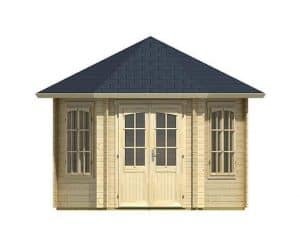 Whilst the instructions are clear and precise, the generous dimensions of this log cabin mean that you and a friend can expect to take at least six hours to install it, possible more. Even with a price tag in excess of two thousand pounds, we feel that this represents good value for money for such a spacious and well built log cabin. 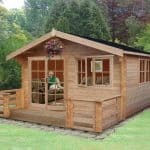 Final Thoughts: Waltons have been making garden buildings since 1878, and their expertise really shows in this striking six sided log cabin. It looks stunning, and it’s a building that we can imagine owners spending hour after hour inside in the summer months. Thanks to the sash nature of the windows, if the interior gets too warm cooling air can quickly be introduced. There’s so much light inside this log cabin, that you’ll also be able to use it as a luxurious workshop if desired. 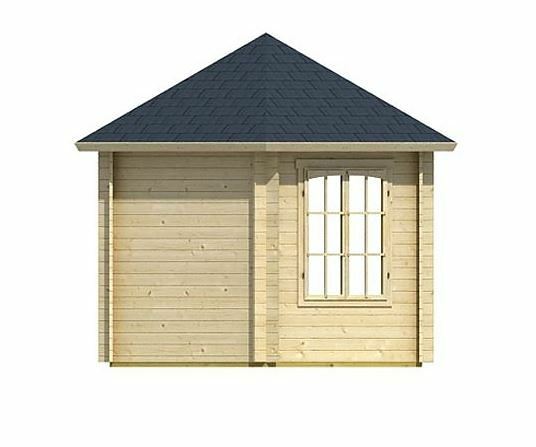 This is also enabled by the very accommodating dimensions, helped out by the tall apex roof and eaves.